How did climate change influence the rise and collapse of the ancient Maya? Figure 1. The Olmec's became very influential on Mayan culture and formed perhaps the earliest complex society in the Mayan regions. Before the arrival of Christopher Columbus in the New World, the ancient Maya thrived and relatively rapidly disintegrated as a major political force. While the Maya, as a people, persisted long after the collapse of the Classical Maya civilizations, their cities were much reduced or abandoned by the time Columbus arrived. Did climate change have an important role in this? This is a question researchers have long tried to answer and recent answers might provide some new insights. The societies that were the precursors to the Maya experienced greater social complexity during the period between 2000 BC and 250 AD. Towns and soon cities such as Nakbe, Kaminaljuyu, and El-Mirador in Guatemala grew too large sizes. Agriculture focusing on maize, beans, and squash developed that helped lead to more long-term sedentary villages that also thrived through increased trade. Pottery and ceramic objects developed along with different forms of stone works, in particular, jade and obsidian works. Communities began to form kingdoms and worship focused on the jaguar in different regions. Sacred kingship soon likely arose. The Olmecs in southern Mexico likely formed the first true complex society that would later influence the Classical Maya civilization as well as the Aztecs (Figure 1). The Olmecs spread throughout central and southern Mexico, while also spreading their influence south to Central America. During this time, evidence from lake sediments indicates oscillating changes in the El Niño/Southern Oscillation (ENSO) winds. This had an effect of providing either greater or less rain. 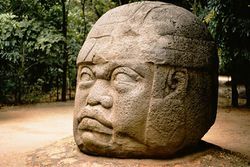 During the period around 1500-600 BC, conditions may have been favorable for increased rain that allowed the Olmecs to thrive and expand, while at around 600 BC and later there is evidence of more drier cycles. In effect, farming may have become more conducive during the early pre-Classical phases of the Maya when the cultural expansion is evident, while its decline in the later phases. Figure 2. 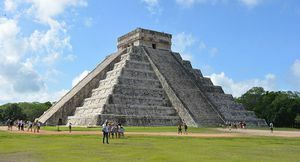 El Castillo is the great Mayan pyramid in Chichen Itza, one of the great Classical Mayan sites. The Classical Maya period lasted from about 250-900 AD, a period that led to the development of large-scale urban areas and monumental architecture. This was a period of city-states and competing polities rather than a single, long-lived and dominant entity. Scholars have compared it to the period of city-states in ancient Greece or Medieval Italy. Some of the largest centers likely had populations of over 100,000 people, occupying areas around Honduras, Guatemala, and southern Mexico. The great Mayan cities, such as Tikal, were politically involved and often influenced by Teotihuacan, the great central Mexican city to the north that likely was the largest city in pre-Columbian Americas, with perhaps nearly 150,000 people. One of the other great cities at this time was Calakmul, which formed as a rival to Tikal. Chichen Itza (Figure 2) to the north in the modern Yucatán, and Copan, to the south in Honduras, also competed with these cities and likely formed alliances, including with Teotihuacan while sometimes coming under the influence of the great powers. The great Maya pyramids were built at this time, which represented temples to the gods and places of sacrifice. Writing was developed, including monumental inscriptions and calendars used to mark events and important cycles. As writing was now used on monumental inscriptions, these also provided dates in which buildings can be attributed to. By around 900 AD, the number of new building inscriptions declines steadily. Soon after this, some of the great cities were either abandoned or were much reduced in population. This transformation has led some scholars to call this sudden change as the "Classic Maya Collapse." Initially, ideas centered around warfare or even disease; however, some scholars noted the rapid changes evident in societies and abandonment suggested something different and more drastic. Out of the possibilities that could lead to collapse, it began to emerge that climate might be a major factor in the decline of the Mayas. There is evidence of increased drought during or around 900 AD, with scholars often attributing the "collapse" period as being between 800-1000 AD. The Yucatecan lake sediment cores show very severe droughts that not only meant less rainfall, but the thin soils that Maya agriculture was dependent on were particularly vulnerable to sudden change as they were also relatively less fertile. Tree ring data and climate modeling have also been conducted, helping to show that there are multiple lines of evidence that likely drought occurred. In fact, in the northern hemisphere at around 800-1000 AD, increasing cold temperature is evident. Those colder temperatures would have had the effect of creating more drier conditions to the south in Mexico and Central America. More recently, more precise information on isotopic changes in sediments has allowed a more direct quantification on how much rainfall had to change to lead to the collapse of the Maya. Recent work has shown that between 41% and 54% (with intervals of up to 70%) of rainfall reduction in the Mayan regions likely occurred. In other words, reduction in rainfall was drastic, and there was an accompanying decline in humidity, which likely led to more rapid drying with rainfall that fell. Relative to today, the region the Maya occupied was very different. It had been assumed the Maya created cities within jungles. However, the regions the Maya occupied were often drier, seasonally wet places that had cyclical rains that the Maya likely increasingly became dependent on. Only later after the cities were abandoned, they became jungles. That pattern of climate began to change between 800-1000 AD, which likely disrupted the agricultural system the Maya depended on. The agricultural system, composed of canals, terracing, raised fields, and other systems began not to be sustainable relative to the new, emergent climate. Wider environmental decline may have accompanied climatic change that affected the success of agriculture, such as a decline in the complex agricultural system created. Although the so-called "Classic Maya Collapse" has long fascinated scholars, the truth is the Maya never really disappeared. In fact, Maya cultures continue to this day. However, after the Classic period, cultures prior to the arrival of Columbus were much reduced. The northern lowlands and highlands began to take more importance in later Maya societies. Mayan cities continued and the last city did not fall until 1697, when the Spanish conquered the last holdout independent Mayan city. Nevertheless, changes after the Classical Maya period indicate that Mayan society did change drastically and it is evident that the environment and climate in Central America and southern Mexico was likely very different than today. Changes that occurred meant that a system that had been created to be adapted to the climate was no longer suitable, leading to a change that meant Mayan societies became smaller-scale and adapted to very different climate and environmental conditions. ↑ For more on the pre-Classical Maya civilizations of Mexico and Central America, see: Estrada Belli, F. (2011). The first Maya civilization: ritual and power before the classic period. London ; New York: Routledge. ↑ For more on the role of El Niño/Southern Oscillation on the rise and collapse of the early pre-Classic Maya societies, see: Brooke, J. L. (2014). Climate Change and the Course of Global History. West Nyack: Cambridge University Press, pg. 310. ↑ For more on the Classical Maya, see: Houston, S. D., & Inomata, T. (2009). The classic Maya. New York: Cambridge University Press. ↑ For more on the role of climate in this collapse, see: Hodell, D. A., Curtis, J. H., & Brenner, M. (1995). Possible role of climate in the collapse of Classic Maya civilization. Nature, 375(6530), 391–394. ↑ For more on the change in rainfall and how much this can be quantified to be, see: Evans, N. P., Bauska, T. K., Gázquez-Sánchez, F., Brenner, M., Curtis, J. H., & Hodell, D. A. (2018). Quantification of drought during the collapse of the classic Maya civilization. Science, 361(6401), 498–501.